Background Transforming growth factor beta 1 (TGFB1) forms a signaling complex with transforming growth factor beta receptors 1 and 2 and has been described as both a tumor suppressor and tumor promoter. Single nucleotide polymorphisms in TGFB1 and a microsatellite in TGFBR1 have been investigated for association with risk of breast cancer, with conflicting results. Methods We examined polymorphisms in the promoter region of the TGFB1 gene as well as the TGFBR1*6A microsatellite in the Nurses' Health Study cohort. Results No overall associations between the L10P polymorphism of TGFB1 or the TGFBR1 microsatellite were detected. 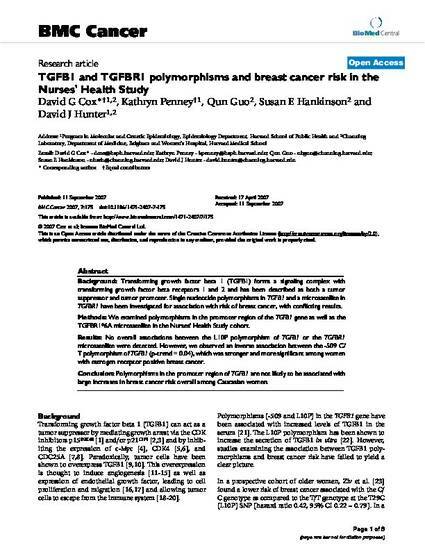 However, we observed an inverse association between the -509 C/T polymorphism of TGFB1 (p-trend = 0.04), which was stronger and more significant among women with estrogen receptor positive breast cancer. Conclusion Polymorphisms in the promoter region of TGFB1 are not likely to be associated with large increases in breast cancer risk overall among Caucasian women.